Hey folks, I feel like I dropped the ball on this one – I had wanted to write this update of our adjustment series when the S&P 500 nominally closed over 2000 – but let me make it up to you with a little information on recent movements. You see, although July 23rd had been holding the ‘actual adjusted closing high’ crown, we’ve actually recently busted through the adjusted return plateau – starting 8/20/2014, every close has been above the late July local maximum. Inflation is CPI-U, I pull it from the BLS via the St. Louis Fed and extrapolate for future inflation from the last 5 months (for individual day estimates). 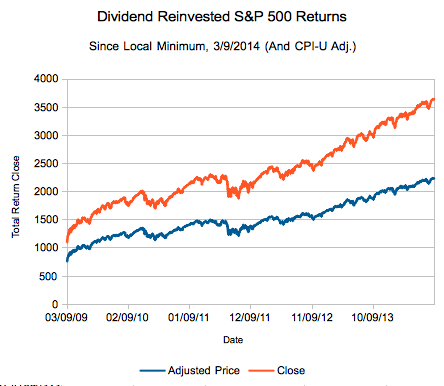 S&P 500 Total Return is an index produced by S&P. Orange is nominal close, and blue is the hero of this series, the adjusted close – adjusted back to January 1993 (for a neutral, bit more than 20 year time period). The chart starts on March 9, 2009 – the local minimum for the current bull market. So, did any of you call the exact/near bottom? How have you performed since then?